When the writer arrived in the UAE in 2006, the nation’s economy seemed strapped to a surging and rocket powered roller coaster, the trajectory constantly upwards. Breathtaking projects competed in turn with astounding initiatives to make up what seemed an unending march of economic progress. In that hectic year, the then Minister of the Economy of the UAE, Shaikha Lubna Qasimi, was quoted in the media as announcing that the UAE Government was introducing a new Companies Law. Much has changed since 2006, but the UAE Companies Law has not. The global financial crisis of 2008 was a fiscal asteroid which changed the business landscape. The crisis is now recognised as a near miss with economic catastrophe, which could well have taken the world to the bottom of an economic abyss almost as deep and black as that which opened in 1929. The 2008 global financial crisis left casualties. Many of the breathtaking projects and astounding initiatives were scaled back or abandoned altogether. Likewise, the UAE Companies Law is yet to be enacted. The long delay has not been kind to the draft Law. Reports circulating in 2006 foreshadowed a new corporate framework with more sophistication and flexibility than any in the region; a Law far more advanced than the 1984 UAE Companies Law which would accommodate the “leading edge” deal making and the sophisticated legal and financial arrangements fashionable before the 2008 crisis. Around 2008, the draft Companies Law disappeared into a Bermuda Triangle of opaque government committees and processes. The draft resurfaced only in 2012. To the dismay of many, the new draft Law had regressed back to the 1984 law, with an extensive but superficial touch up. Most provisions have been “fine tuned” but nothing much has changed. It will be difficult for observers to detect changes in business practices or legal processes when the new law is enacted. Although the draft Law has now received the approval of Federal National Council it has no force of Law until the UAE Council of Ministers approves it and the Federal Supreme Council enacts it. Media reports on the new Companies Law have until recently speculated it would liberalize the existing 49% limit on foreign investment (possibly in services sectors and in the areas of “mega projects” of national importance). Foreign investment policy issues have been kicked down the road into a new Investment Law, which to date remains unseen. Below is my top five “wish list” of things which are missing from the new Law but which would be welcomed as reforms. Under both the 1984 Law and the new Law, public offerings in public joint stock companies must constitute fresh capital raisings and there is no ability for founding shareholders to sell down. This restriction on sell-downs reduces the attractiveness of local financial markets to issuers and renders UAE IPOs of limited use as a liquidity exit for private equity players. Just as in the 1984 law, every issued share must be a voting share with the same voting rights attached. This inflexibility inhibits sophisticated financing transactions and also creates problems for family businesses wishing to put in place orderly succession and stewardship. Under the 1984 Law every shareholder in an LLC has a statutory right of pre-emption over all the other shares that they do not hold and this regime continues under the new Law. It would be flexible and useful if shareholders could opt in or out of pre-emptive rights in any LLC, according to the terms of the Company’s agreed Memorandum of Association. The 1984 Law provides no machinery securing investors in listed companies with an adequate timeframe to consider any proposal for change in control; nor does it specify the type of information which should be provided to investors where a takeover bid is made. There is no compulsory acquisition machinery to provide a way for successful bidders to “mop up” non-responsive small minorities. There would be great benefits to the facilitation of everyday commerce, finance and dealings with government authorities if the new Law specified statutory assumptions which outsiders dealing with general managers of Companies are entitled to make; in particular, outsiders should be able to assume that a general manager of a Company has the power to enter into transactions and sign official documents for and on behalf of the company without viewing notarial powers of attorney given by shareholders. However, to work to best effect, those provisions would require the back-up of a public and online database of company managers, a public record which presently exists only in relation to the officers of DIFC companies. 1. Abolition of the “two shareholder” rule in the case of LLCs. LLCs continue to be restricted to fifty shareholders but they will be permitted to have only one shareholder. 2. Ability to pledge shares in LLCs. The new law expressly permits shareholdings in limited liability companies to be pledged to secure debts. It is not clear if only banks licensed by the Central Bank will be able to take the benefit of such pledges as security (a restriction which applies to real estate mortgages). 3. The ceiling of five on the number of individuals who can serve on the Board of Managers of an LLC will be removed by the new Law. This will be the first time UAE Law has imposed a prohibition on financial assistance in these transactions. This allows the issue of new joint stock company shares through placements to particular investors without having to exhaust the statutory pre-emption rights over new issues, provided the placement is made to a strategic investor involved in the same or a related industry as the company. 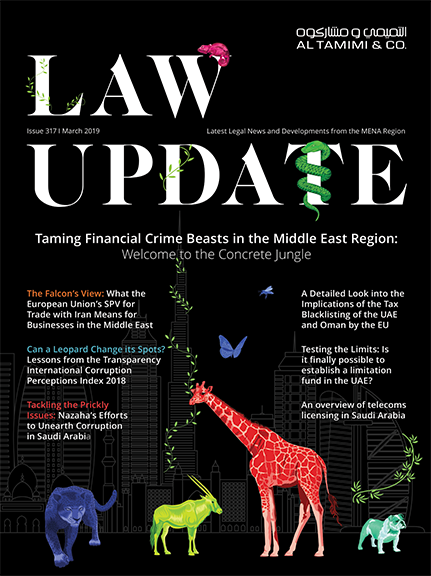 Aside from the long period taken to deliver a modest degree of change, the other curious thing about the new Law is that it does not incorporate provisions which would facilitate sophisticated financial and legal structures and arrangements commonly used in the UAE. Ironically, many of these sophisticated structures and arrangements are used by government owned business and investment entities. The new UAE Law is also less sophisticated and flexible than the DIFC Companies Law and the corporate laws recently enacted in some other GCC countries, including Bahrain, Qatar and Kuwait. The new Law is undoubtedly a step forward, but it is a conservative and carefully measured small step forward, not a great leap for law reform.